Kredent InfoEdge Pvt. 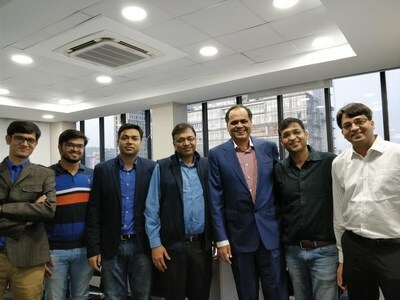 Ltd., a leading FinTech company from Kolkata, has announced that it has received Pre-Series A funding from renowned stock market investor Mr. Ramesh Damani and others. This is the first time Kredent InfoEdge Pvt. Ltd. has raised funds from external investors. Over the last decade, it has positioned itself uniquely in the FinTech startup space in India by focusing on financial education and stock market data analytics. The company's vision is to simplify finance for everyone by providing right learning and relevant analytics for effective decision making. Announcing the investment, Mr. Vivek Bajaj, Managing Director of the company, said, "We are excited to have Mr Ramesh Damani joining us as an investor. This round of funding is a testimony to the bright future that FinTech startups like us, with focus on knowledge, have. Kredent InfoEdge has always been on a mission to spread financial literacy in India and this investment made by Mr. Damani will enable us to introduce new and innovative products that will help the participants to build a career and the investors, traders and professionals to profit from the markets." Mr. Ramesh Damani said, "I have closely watched the journey of Kredent InfoEdge over one year and its intense focus on innovation has always given me a lot of confidence. Empowering retail investors is the need of the hour and Kredent has already made its mark in the FinTech industry and now I am excited to be able to further catalyse its growth as an investor." Kredent InfoEdge is currently developing new products that will bring investment in various financial assets within the reach of the common people of India. It is committed to improving the wellbeing of every Indian and securing their financial future by enabling them to make educated financial decisions backed by the right data and decision support tools. Mr. Ramesh Damani holds a master's degree from California State University at Northridge and has been a member of the Bombay Stock Exchange since 1989. He is exceptionally skilled at identifying promising businesses and invests in them for the long term. He is very optimistic about the future of India and feels that the rate of growth that the country will witness in the next 20 years is going to be very exciting. He is bullish on India's SME story and firmly believes that many of the companies that are getting founded now hold the promise of becoming behemoths in the future. About Kredent InfoEdge Pvt. Ltd.
Kredent InfoEdge Pvt. Ltd. started its journey a decade back with Kredent Academy, which provides classroom courses on finance in Kolkata. Its second venture Elearnmarkets, which was established in 2015, offers over 100 e-learning courses in finance and has trained more than 50000 students till now. It offers various career-oriented courses with joint certification from NSE Academy, NCDEX and MCX and expert led boot camps, seminars and webinars. In 2016 Kredent InfoEdge introduced StockEdge, a self-help stock market analytics app that has been downloaded by more than a million investors till date. It has recently introduced a premium plan and the StockEdge Club, a community of stock market investors. It focuses on providing education and networking opportunities to the members both online and through its chapters in eight cities across India.